AT EASTERN UROLOGICAL ASSOCIATES, WE STRIVE TO PROVIDE THE BEST UROLOGICAL CARE IN NORTH CAROLINA. EVERYTHING WE DO IS CENTERED AROUND OUR PATIENTS. As urologists, we specialize in treating conditions of the urinary tract of men, women, and children, including all diseases of the prostate, bladder, kidneys, and male reproductive organs. Our expertise includes specializations in incontinence, male infertility, erectile dysfunction, stone disease, voiding dysfunction, and more. We offer the most current options in medical and surgical technology, including robotic and minimally invasive surgical techniques, alongside nationally recognized clinical trials. We're pleased to announce that EUA's own Dr. Reeves has been designated as a UroLift® Center of Excellence! We're honored to acknowledge this accomplishment as we continue our efforts to provide the best urological care in North Carolina. You can listen to Dr. Reeves' remarks in this video! For more, check out the full article in Business Insider. 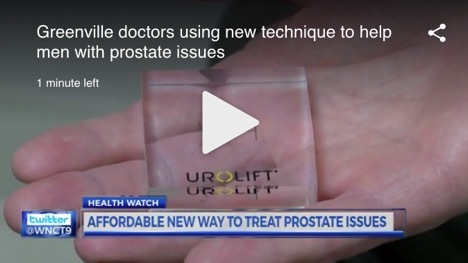 WNCT recently featured our Eastern Urological Associates and our groundbreaking work with UroLift®, a new treatment for prostate problems. Click here to learn more about it!